Real time stock supply data for your raw materials, components and final products. Find out how you can track your manufacturing orders and have real time stock supply data. Produce final products and components from raw materials using simple manufacturing orders. Organize your product catalog and track items by raw materials and final products. Choose simple one-warehouse option or track your inventory using warehouses for raw materials and final products. 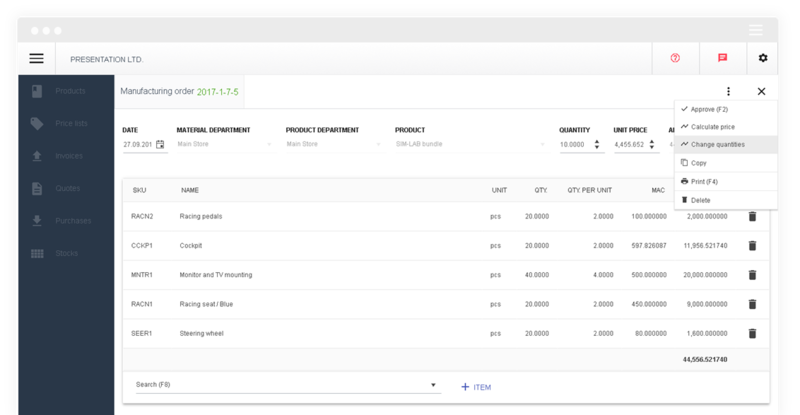 Easily start your manufacturing tracking using product recipes (bill of materials). Production costs are automatically calculated based on moving average cost of materials and done work. Real time info of total quantities that are producible with current raw materials stock supply. Free pilot Take the next step in your business with a guided free pilot - schedule a private demo today! Get a clear real-time overview of current stock supplies on multiple warehouses - from any location with Internet access. When to make a new purchase? Be alarmed when stock supply is below the set minimal quantity or the expiry date is coming up. Personalize the data you get from Backstore by activating columns you find important for your business. Your inventory is a mess?